There is nothing more that can scare us. The human being has already experimented every form of pain. Everything is Beautiful, and Nothing Hurt is the fifteenth album by Moby, released for Little Idiot and Mute. The artist used the words of the epitaph engraved on the plaque of World War II veteran Billy Pilgrim (protagonist of the novel by Kurt Vonnegut Slaughterhouse-Five) to give a title to his darkest album. After expressing high forms of electronic punk-rock, thanks to the Void Pacific Choir project, Richard Melville Hall presents a post apocalyptic scenario translated in music. We wake up together with Moby in a space far from the world we remember. A new frontier of humanity is ready to welcome us in its gloomy arms. Falling Rain & Light is a dream song that makes us tremble for the future of our society. The video shows Planet Earth tired and raped by the wickedness of the human being. "After Humans" is the introduction title for a series of black and white images showing the uninhabited and abandoned Planet Earth. Animals run happily and free while the objects we left here are roting. Planet Earth would be a better place without us? In The Sorrow Tree the female voice of Julie Mintz joins to a hypnotic form composed of almost orchestral synths. A chorus similar to that of the sirens that enchanted Ulysses captures us in its magic. The words of The Middle Is Gone seem to be the darkest of the whole album. Prophetic thoughts arise and who saw the worst part of the world confronted it and emerged victorious. But the victory of Pilgrim and of all those who face war is always a mutilated victory. What we lost by the way is more important than what we have conquered. Pilgrim spent a year in a German prison camp. A period that traumatized him, preventing him from returning to being the man he was before. Surviving, sometimes, can be a conviction. Mere Anarchy suggests us how to manage the near future. In the simplest anarchy we may perhaps return to giving value to things. No government to guide us, no commander who could put us in danger. No religion to guide us. The cover of Everything was Beautiful, and Nothing Hurt immediately brings us into the idea that Moby has of the society in which we live. 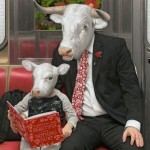 A Father and his son in a non-human but bovine form are reading a book with a red cover in the subway. Can reading free them from the animal form? The Moby's meditative electronic is painted with dark colors that drag the listener into a post-traumatic dimension without reference points. In the nine tracks of the album there is the chance to understanding our greedy times. Have we already surrendered or are we still able to rebel against the static nature of things? Melancholy is ready to welcome us but the desire for freedom seems to be even stronger. Moby is for all music lovers a safe rock on which we can take shelter in moments of greater storm. Let us entrust ourselves to his music in order to go ahead.